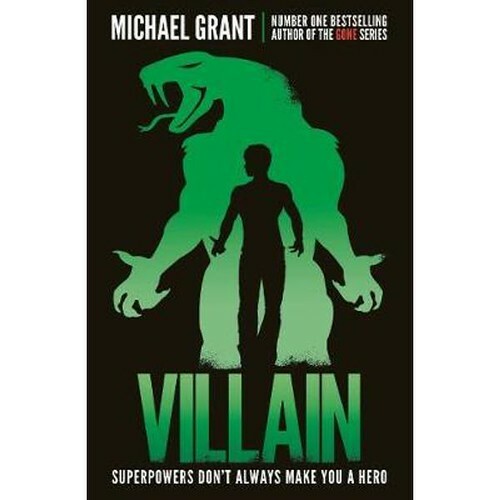 I’d been all set to muse a bit about third books in trilogies, when Helen Grant mentioned another [potentially bad] aspect of writing trilogies, at her Thursday launch. When asked about the likelihood of a sequel for Ghost, and the question then sliding quickly on to trilogies, Helen pointed out that one awkward thing about them is that for the author who carefully plots books one, two and three, there is much that needs to be written after the first book. But if that doesn’t sell well, the publisher might decide against the next two books. And then where will you be, a third into a story and no end in sight? It is, of course, what initially happened to Nick Green’s The Cat Kin. He self published the second and third books, before the whole trilogy was picked up by Strident. But as Helen said, while she was lucky with her Forbidden Spaces trilogy and it did get published, there was perhaps rather too scant attention from the publisher towards the end. So, there is every reason to stick to standalone novels. There is always the possibility of sequels by public demand. Anyway, what I was really getting to here, is the seeming lack of interest from publishers when book three is about to be born. Increasingly, I hear nothing about the ends of trilogies, and there are no review copies available. I always feel a bit guilty at this point. Am I merely seen as looking for a free book for my own reading pleasure? While I can see there might be less of a need for a big fanfare or a highly publicised launch for the end of a trilogy, a few review copies won’t cost much, compared with other kinds of advertising. Maybe not send out unsolicited book threes, but send to anyone who inquires? Because I feel third books have often been the best. It’s as if the whole trilogy has been moving towards this point. Not that it’s only a book much the same as the first two and what’s the fuss? Helen’s Urban Legends was riveting. Especially page 38! And the third books in Michael Grant’s Front Lines and Lee Weatherly’s alternate WWII series were masterpieces of great YA writing. Maybe publishers assume that the fans liked the first ones, so they will discover a way to the end, without reviews or mentions of the books. These days I find myself looking at sequels to books I’ve never heard of, or the last in a series of books where the publisher has dutifully sent out both proofs and finished copies, when I’ve not shown interest in any of them. Hmm. Eleven already. That year went fast. This time cake is just about the only thing I can think of. I suppose if thinking about it is all I do, there is no harm. Just don’t bake, Witch! I have achieved my February tradition of reviewing the latest Front Lines novel by Michael Grant. And I frequently think of all the wonderful authors out there. That hasn’t changed over the years. Nor have they. It would seem authors don’t grey as fast as some of us. 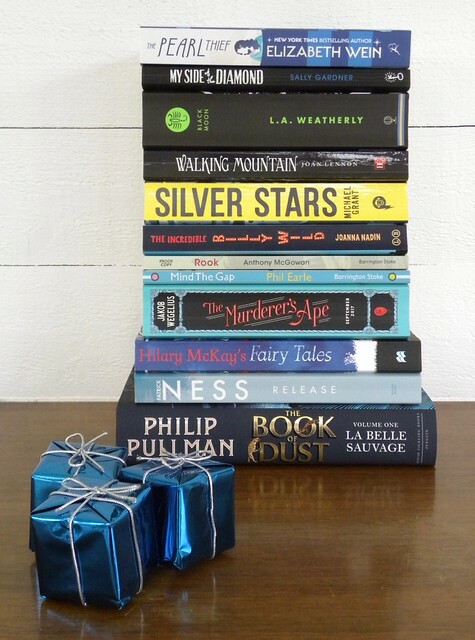 Because when I have read a really, really great book, and I know that there are plenty more of them, I feel terribly reluctant at the thought of reading some of the ones sent to me, at the cost of a better reading experience with some other book. I am selfish enough to feel my time deserves the best. And the publishers don’t. Not as much, anyway. I’m sure it will work out. I have heard of libraries. Maybe I can find books there? Meanwhile, I do have some cream in the fridge. What if I baked just a little cake? I have the tulips already, courtesy of Helen Grant. Two kinds of purple, they are. Two things cheered me up this week, and kept me going. Putting the finishing touches to the translated Maria Turtschaninoff interview, I was reminded again of how much Maria’s strong female characters meant to me. Because if truth be told, I am often put off – otherwise excellent – books when there are too many toxic relationships between girls. I know that often the whole point is that we read about their troubles, to discover how they overcome, or not, the trials of getting on with each other. 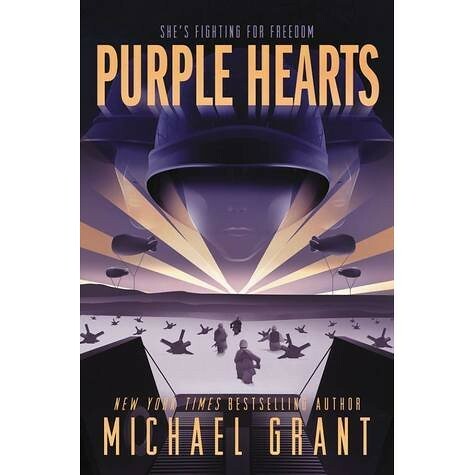 And reading Michael Grant’s Purple Hearts, taking courage from how his soldier girls have grown in their soldier’s boots, executing ‘male’ tasks as well as the men, and sometimes better, not putting up with their stupid comments and prejudice. Yes, I’m looking at you, Private ‘Sweetheart,’ but you learned your lesson, didn’t you? So maybe Rio’s best friend Jenou enlisted in the belief that she could be an army typist somewhere safe, flirting with soldiers, while doing her bit for the war. But she did just as well – better, really – marching in the heat or in the cold, hiding in holes, cold and wet and hungry, with lice everywhere you could mention, and in some other places too. 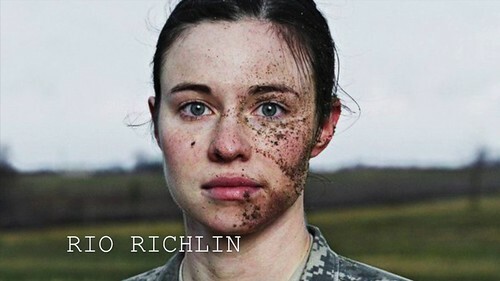 All those trailblazing female soldiers made me cry with pride. And they too could cooperate, whether or not they liked the other soldier. I suspect that neither Maria nor Michael could have imagined the current state of relations between the sexes when they wrote their books, even though it wasn’t all that long ago. Things have moved fast, and not in the right direction. We need more writers like this. I mean, we need writers to write about this. I ought not to suggest that authors might not share these opinions. As for me, I’ll probably continue to shun any books with plots that seem a bit too catty, or misogynistic. I was sad to get to the end of Michael Grant’s Front Lines trilogy, because now there is no more to read. But I was glad the war was finally over. Not everyone survived, because that’s the thing with wars; people don’t. Purple Hearts, along with Front Lines and Silver Stars, will count among the best I’ve read. It’d be easy to dismiss this fast paced WWII trilogy as pure entertainment, but it is so much more. For a start, what makes it stand out is the use of women soldiers, alongside the men. Michael makes a stand for equality, for men and women, for black and white, for ‘real’ Americans and for those others who fought by their side. The Front Lines books teach us history. There was much I didn’t know. It’s given us rounded and interesting characters – I even grew fond of Private Sweetheart in the end – and it tells us how stupid, and evil, people have always been, and will continue to be, but that there is good in so many of us. You have to care. And in order for us to care about those who had to die, Michael shows us, however briefly, what they are like. This way we mourn their deaths. Otherwise it’d be like it ended up being for those worn out GIs, who didn’t learn the names of new soldiers, on the grounds that they wouldn’t last long. Starting in June 1944 we first fight on Omaha Beach. It didn’t take me long to realise Michael was making a detour via Oradour for one of our heroes. Mercifully it was quick (I have read a whole book about it), as was Malmedy (which I didn’t know about). And the concentration camps… Brief is almost better, with one major atrocity after another, the reader is with the GIs as the European continent is – slowly and painfully – conquered. My guess as to which of the main characters was ‘writing’ all this down was correct. My hope for some of the more romantic elements worked out. We need hope. I could go on. Purple Hearts is an inspiring read. We could have done with women like these a long time ago. And I [almost] blubbed over one name. Diane. It’s continuity like that which makes a story.